Cozy ranch style home for Maine rental with beautiful water views. Enjoy a fire by the water! View of the cove. View from the back deck looking out at the cove. View of the cove from back deck. The front of the house facing a very quite Long Point Rd. View of the house from the garage end. The view of the cove side of the cottage View of the rear of the cottage. The view across the street Just a short walk up the road you`ll find this cove, a perfect area for lounging, especially at low tide. View of open ocean and sail boat from lot across the street fire pit with chairs adirondack chair at fire pit with open ocean view View of living room. Alternate view of living room. Anther view of living room. View of bright kitchen. Another ciew of the kitchen. View of the dining area. View of the kitchen from the dining area. Bedroom with twin bed. Bedroom with queen bed. Bedroom with full size bed. Bathroom View of another living room/den area near the bedrooms. Another view of the additional living room/den area near the bedrooms. Another view of the additional living room/den area near the bedrooms. Cozy ranch style home, located on a quiet, waterfront peninsula. Enjoy beautiful ocean views from the front of the cottage, and scenic coastal sunsets from the back deck. Walk down to the rocky beach area, which is also a great spot to launch a kayak. Upon entering the cottage there is a lovely sitting room with a library and views of the water with a door out to the back deck. Through the sitting room there is a small kitchen and beyond that a dining room table and another door out to the back deck. Continue past the dining room and you will find a full bathroom, another living room area with water views and three bedrooms. 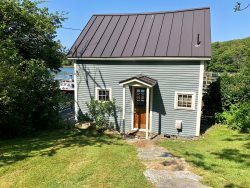 The location of this cottage is such that you feel like you are on a secluded island with a small population, yet you are a short drive to local amenities in Brunswick or amongst the other islands of Harpswell. You guys are basically awesome! Great value-gorgeous views and area in general! We all enjoyed our stay here, truly beautiful and peaceful, it was a mother and three daughters trip. Mom is 88 and loved it here, we had company and they all enjoyed it as well. Would highly recommend this cottage, everything you need is right here. Very roomy, beds are comfy, water views are beautiful. Our favorite room was the second living room looking out at the water and boats. Across the street is a perfect spot with the firepit and ocean where I was able to pick a lot of Sea glass to bring home!